As some of you will recall, I’ve failed to mention that while although founder Bruce McLaren lost his life in a testing accident at Goodwood in 1970, the team did indeed carry on and upon its third attempt was successful in winning the prestigious Indianapolis 500, which had been one of Goodyear’s incentives for sponsoring the team, albeit this first victory came at the hands of customer Roger Penske, could McLaren win at the hallowed Speedway? 1974Model: M16C/DAfter the horrific ’73 Indy 500, major rule changes were made to the regulations in regards to safety, with an emphasis on fuel protection and vehicle length being shortened to a maximum of 15 feet to reduce speeds, as competitors had been flirting with speeds of nearly 200mph. David Hobbs joined the Works effort as Rutherford’s teammate aboard his Carling Black Label liveried mount and qualified ninth at Indy while Johnny missed the first week of qualifying and would be forced to start 25th with a speed of 190.440mph clocked during the second week of qualifying. Yet, the even year charm was once again cast upon McLaren as Rutherford stormed his way to the front to capture his first Indy 500 victory while Hobbs finished a respectable fifth… Rutherford went on to take three more victories that season at Ontario, Michigan and Milwaukee. Meanwhile, Penske’s 1974 USAC campaign saw major driver changes, as Donohue had become thoroughly frustrated during 1973, that he’d announced his retirement from racing. Thus, the recuperated Gary Bettenhausen would become Penske’s lead USAC driver, with a second Indy 500 entry slated for Peter Revson, which sadly would never occur as Revson was killed in F1 pre-season testing in South Africa. Bettenhausen’s entry was sponsored by Score, a motor oil product developed by Sunoco which would later be renamed CAM2, as Sunoco was hesitant to run its Oil Company sponsorship in the wake of the current energy crisis, even though Methanol wasn’t an oil derived product. Penske then selected Mike Hiss, a Californian native to replace Revson, as Hiss had previously been the 1972 Indy 500 Rookie of the year and substituted for Bettenhausen in ’73. Hiss was the first Penske Racing driver to pilot the “Norton Spirit,” in what would become a long standing partnership. Hiss was quick to show up his elder teammate, by qualifying third at Indy, while Bettenhausen could only muster an 11th place grid slot. Yet, Bettenhausen’s Offenhauser engine would expire on lap 2 while Hiss would suffer two painstakingly long pit stops to diagnose and rectify electrical problems before ultimately finishing 14th, albeit 42 laps behind. 1975Model: M16ENow five years old, the M16 model received further design refinements, which saw the new model updates “penned” by Gordon Coppuck’s assistant, an English bloke by the name of John Barnard, as Coppuck was fully engulfed in the Formula 1 side of the house, as McLaren’s M23 had won the 1974 World Championship with future Indianapolis victor Emerson Fittipaldi. After having ran two cars in 1974 with less then expected outcome, Penske increased his Indy 500 entry tally to consist of three modified M16C/D’s for Bobby Allison, Mario Andretti and Tom Sneva, the fastest school principal ever. Ironically Sneva, a fellow Dirt Tracker himself, was hired as Gary Bettenhausen’s replacement for the 1975 season after The Captain had grown tired of Bettenhausen being constantly injured, as Mike Hiss had filled in at Penske once again after Bettenhausen had suffered severe nerve damage to his arm in a Dirt Track race at Syracuse, NY. Meanwhile, at McLaren, Lloyd Ruby replaced “Hobbo” (Hobbs) as Rutherford’s wingman and the rain soaked race was halted on lap 174 with Bobby Unser’s Works Eagle being declared the victor, while Rutherford finished runner-up. 1976Model: M16EIn another tough year of finding sponsors, McLaren retained Rutherford as its sole driver, which would pay off handsomely, as Johnny once again secured the Pole position (188.950mph) and piloted his Hy Gain sponsored McLarein to his second Indy 500 victory, as the even year charm worked once again and would become the factories third and final win at the Speedway. Meanwhile Roger Penske continued to soldier on with McLaren, with Tom Sneva once again his primary pilot, at the controls of the Norton Spirit, while veteran driver Mario Andretti was hired to contest the Indy and Pocono 500’s in a second CAM2 sponsored Penske entry. For 1977, McLaren debuted the M16’s predecessor, the M24, of which had actually been an earlier exercise in 1971-72, when the team had grafted the M23’s 3.0 liter Cosworth onto a M16 test mule which led to the development of the M23, with which McLaren would win two Formula 1 championships with in 1974 and 1976. With the arrival of Cosworth’s 2.65 liter V-8 turbocharged DFX variant, at last the Offenhauser became obsolete, as the DFX would propel the M24 to new heights. Although Mario andretti was the first to pass the 200mph barrier, the first official one lap record would be set by Tom “The Gasman” Sneva at the Brickyard with his pole setting run of 198.880mph, including a top lap speed of 200.535mph! As both drivers remained in Penske’s employ that season. With all of the hoopla surrounding Sneva’s 200mph blast, the “Works” McLaren team effort was greatly overshadowed, as Rutherford could only muster a 17th place starting position and would finish dead last, retiring after only 12 laps with gearbox failure. 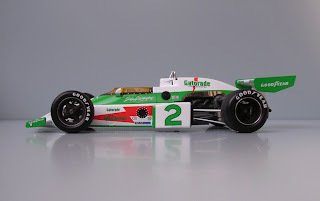 Ironically, the first M24 racecar had actually been completed in 1976 with the second chassis being delivered to Penske later that season, although Sneva and Andretti would outshine Rutherford during the month of May. Yet, interestingly the ’77 Penske chassis were heavily modified cars that served as rolling test beds for what would become Penske Racing’s Engineer Geoff Ferris’s Penske PC6 chassis the following season. The engine was actually a (Cosworth) DFV variant. Not a DFX variant. At McLaren - McLaren engines built their own engines for Johnny Rutherford and for Roger Penske, as did Vel’s Parnelli Jones for Al Unser Sr. and Danny Ongais. They were not really officially DFX’s until Cosworth came into Indy car racing and Larry Slutter (formerly of Parnelli’s) went to work for Cosworth in North America. Model: M24BFor 1978 McLaren upgraded the M24 chassis to its final configuration and one updated M24 along with a new M24B chassis were on hand for Johnny Rutherford’s hoped for even year mojo at the Brickyard, as the team was running a single car effort for Johnny with First National City Travelers Checks as their sponsor. There were two M24’s to fear that year at Indy, with the Works team and privateer Jerry O’Connell’s Sugaripe Prune chassis piloted by Wally dallenbach, yet Tom “The Gasman” Sneva was on pole again with a speed of 202.156mph, while Rutherford lined up fourth at 197.090mph and Dallenbach started seventh at 195.220mph. 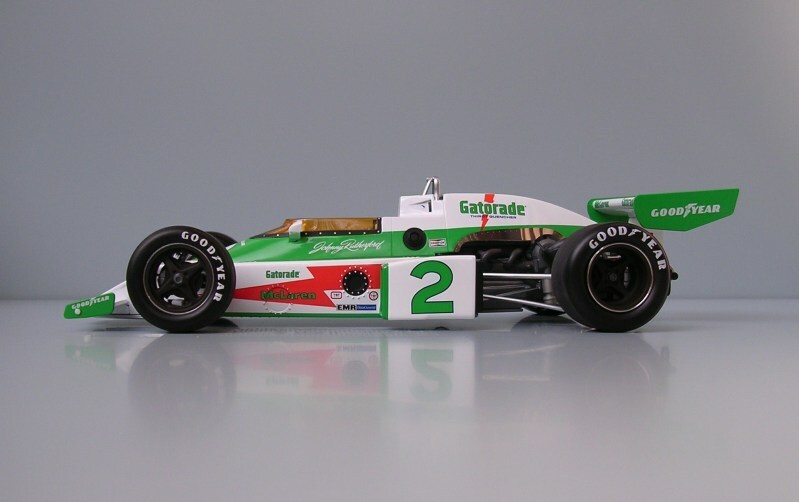 Future CART Chief Steward Dallenbach was the highest finishing McLaren, coming home fourth, while Rutherford finished 13th, behind Janet Guthrie, with Salt Walther in a third M24 winding up 28th, retiring with clutch issues, while three older McLaren Offy’s finished in various positions. 1979 was the final year of factory participation in IndyCars, as Team McLaren ran a single car in Budweiser livery for Johnny Rutherford, yet the team was on a slow downhill slide and Rutherford was hard pressed to compete against the newer era IndyCars, while Tom Sneva had taken over the bright yellow O’Connell Sugaripe Prune and continued to drive the wheels off of the aging McLaren M24 chassis, affectionately nicknamed ‘Ol Hound. Rutherford lined up eighth and finished 18th, with Sneva starting 2nd and finishing 15th due to an accident on lap 188, while the highest placed McLaren Cosworth was Roger McCluskey’s privateer National engineering entry, finishing 13th. But, with McLaren trapped in mediocrity, having become uncompetitive in Formula 1 and the newly formed Championship Auto Racing Teams (CART) series, as the newer ground effects chassis were making the McLaren’s obsolete, along with lack of sponsorship and Rutherford having left to drive for Jim Hall’s Chaparral team, McLaren decided to shut down its Indy Car operation and focus solely upon Formula 1. Ironically, Rutherford would win his third and final Indy 500 in 1980 behind the wheel of the Yellow submarine, a.k.a. the Chaparral 2K, a revolutionary ground effects chassis designed by John Barnard, who in later years would design Formula 1 World Championship winning chassis for McLaren before working his design magic on Ferrari’s ill handling racecars. Yet, there were two last minute flashes of glory for the McLaren IndyCar’s, as originally Tom Sneva had been set to race the Bon Jour Action Jeans sponsored Phoenix ground effects chassis for O’Connell’s team and had qualified it fourth. But an accident left the car destroyed and the team was forced to settle upon rolling out ‘Ol Hound, its three years old M24 chassis. As the Indy 500 rules stipulated, Sneva would be required to start dead last in the field, yet The Gasman was soon mixing it up midfield and even briefly led before finishing runner-up to Rutherford, as this impressive feat of going from 33rd to 2nd had never been accomplished before. ANONYMOUS:In 1979 Indy had been resurfaced and the (McLaren) Works-team broke top gear on lap 99 having just taken the lead from Al Unser Sr. in Jim Hall’s Lola. We replaced the gear and finished back in the field. Man, you did your research. Good work! I found out the other night that it's hard to find historical information like this on pretty much any series. Keep it up. Yeah this is a really well put-together site, I like it. Great Post Tomaso. You really put in a lot of work and reasrch into these last few post. Thanks for the hard work. Now I have a question. Whats the deal, no "girl fight" Coverage? I Thought you would be all over the Danica Patrick Vs. Milka Duno story. As for the Princess Danicker vs. Milka 'Licious prize fight, I was out of the country and therefore miss the action, but hear it was quite entertaining... So who won the Cat Fight? Great informitive story if you would like to see some of the Indy McLarens check out my flickr site at. Great stuff...so i was wondering your thoughts on the 1979 McLaren indy car. I have the 1979 car from O'Connell Racing (serial No 1002, Cosworth engine with spare). Finished 11th @ Indy in 1980. My father actually owned it but passed away a few years ago.